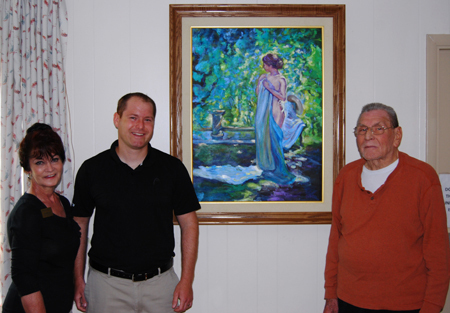 Marc Salmin (center) is joined by his father Alex (right), Resident, and Linda Ohlsen (left), Activities Director, McPeak's Assisted Living, in front of the painting he donated to McPeak's. Northport resident Marc Salmin recently donated a painting he made to McPeak's Assisted Living to show the facility's staff members his appreciation of the way they care for his father, Alex. Mr. Salmin's father has been a resident of McPeak's since 2011. Mr. Salmin recreated "Louisa in the Outside Studio," which was originally done by William Starkweather, an American Impressionist painter. Mr. Starkweather started his artistic career in the late 1890s as a student at the Art Students League in New York City. He frequently took painting trips through the Northeast, including New York; Eastport, Maine; and Grand Manan Island, New Brunswick, Canada. His artwork can be seen today in the Metropolitan Museum, the Brooklyn Museum and the Hickory (N.C.) Museum of Art. "I recreated this painting because I admire William Starkweather's work. He is not a very well-known artist, but he was influenced by other famous Impressionist painters the same way I was influenced by him," Mr. Salmin said. "I donated this painting to show my appreciation to the McPeak's staff. I could not have asked for a better assisted living facility to take care of my father." Mr. Salmin studied computer graphics at Rensselaer Polytechnic Institute. After graduation, he worked as a professional airbrush artist in Colorado. He is currently an art teacher at St. Francis Preparatory High School in Queens. "We are so grateful for Mr. Salmin's generous gift," said James McPeak, Owner, McPeak's Assisted Living. "We strive to provide outstanding services with our residents' health, safety, comfort and general welfare in mind. This beautiful painting will also brighten the facility's rec room, where it can be viewed by the residents, as well as the staff."